The concentration of nitrous oxide (N2O), an important greenhouse and ozone depleting gas, has been increasing rapidly in the atmosphere (figure, right). N2O can be produced and consumed in the ocean interior by a variety of processes (eg. nitrification, denitrification, ammonia oxidation). Some of this N2O escapes to the atmosphere and makes a significant (~30%) contribution to the atmospheric budget for this gas. Production of N2O in the water column is sensitive to dissolved oxygen concentrations. The recently observed expansion of low oxygen zones in the ocean may significantly increase the rate of the production and export of N2O to the atmosphere in the future. Full water column measurements of dissolved N2O were made by the PMEL Ocean Tracer group in pilot studies at the Hawaii Ocean Time-Series (HOT) site (right) and along two recent sections in the South Atlantic (below) as part of the global CLIVAR Repeat Hydrography/CO2 Program. Dissolved N2O measurements were made on the same samples as for the anthropogenic tracers CFC-11, CFC-12 and sulfur hexafluoride (SF6). Dissolved N2O concentrations in near-surface waters were on average slightly above equilibrium with the atmosphere. Pronounced subsurface N2O maxima were present in upper waters, usually associated with high Apparent Oxygen Utilization (AOU). Deep and abyssal N2O concentrations were on average slightly above modern atmospheric equilibrium. 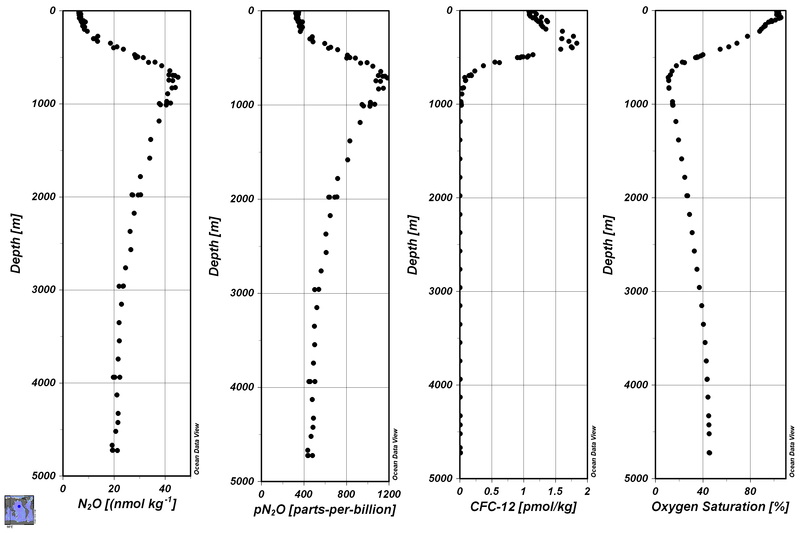 Significant levels of CFCs were present in the N2O maxima, indicating decadal time-scale communication of these waters with the sea surface. Including N2O measurements routinely on future CLIVAR cruises will allow the evolution of this signal in response to large scale changes in biogeochemical processes and ventilation in the global ocean to be determined. Partial pressure N2O (pN2O) on CLIVAR A10 section along 30°S in 2010 (see map showing section line below). Oxygen on CLIVAR A10 section along 30°S in 2010 (see map showing section line below). Map showing location of CLIVAR A10 section line. 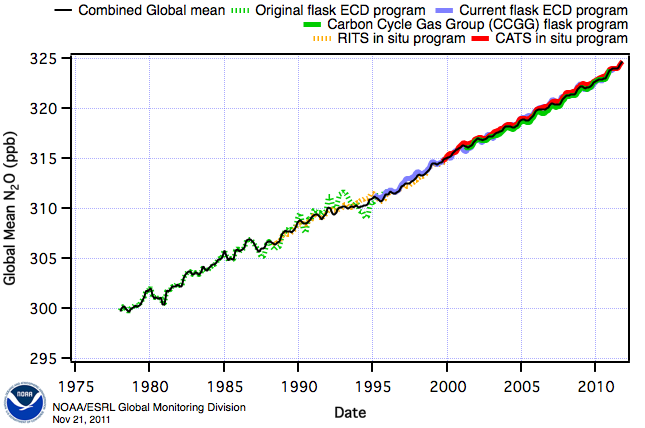 Atmospheric increase of nitrous oxide (from NOAA/ESRL/GMD). Click image to see full size figure. Vertical profiles of N2O, pN2O, CFC-12 and oxygen saturation at Hawaii Ocean Time-series (HOT). Click image to see full size figure.